Lucknow was the state capital, some three and half hours away. I was having breakfast at my ‘luxury’ hotel. It had a fanciful name like GreenView or GardenView, though the only green garden to be viewed was a ribbon-like strip of lawn in front of the hotel that looked more like a patch of bedraggled AstroTurf. I was assured that I’d been given one of the best rooms. My ‘royal suite’ came with two slightly ratty armchairs, a couple of wobbly plastic chairs and some nondescript artwork on the walls. Their placement made me suspect they were hiding damp patches. There was a dining room that seemed to open only for breakfast, but breakfast itself came with no choices. That day was ‘butter toast and omelette’ day. I had assumed I would get some buttered bread but I did not realise in these parts butter toast was an entity in itself – a piece of thick, slightly charred toast on which someone ladled an artery-clogging splash of melted butter from a big saucepan. All this to say that by the time I got that call I was not in the best of spirits. I was reporting on India’s 2014 general election, the one that would bring a tough-talking man named Narendra Modi to power. Sultanpur was a dingy, noisy town with narrow streets, filled with honking motorcycles and stray cows and donkeys eating garbage. Outside the congested lanes of the town, the country roads were potholed and meandered through villages with names like Teergaon and Isouli. Men here wore white turbans and women arranged their saris to veil their faces and buffalos dozed placidly in village ponds. This was what journalists always called the ‘heartland of India’. It was my first time in the heart of the heartland. Born and raised in metropolitan Kolkata, I already felt like a fish out of water here. But this was also where the election promised the greatest fireworks. This was the region from which India’s old political royalty had stood for election for generations. Rahul Gandhi, great-grandson of India’s first prime minister Jawaharlal Nehru, was the candidate in neighbouring Amethi. Running against him was a television star given to fiery rhetoric. 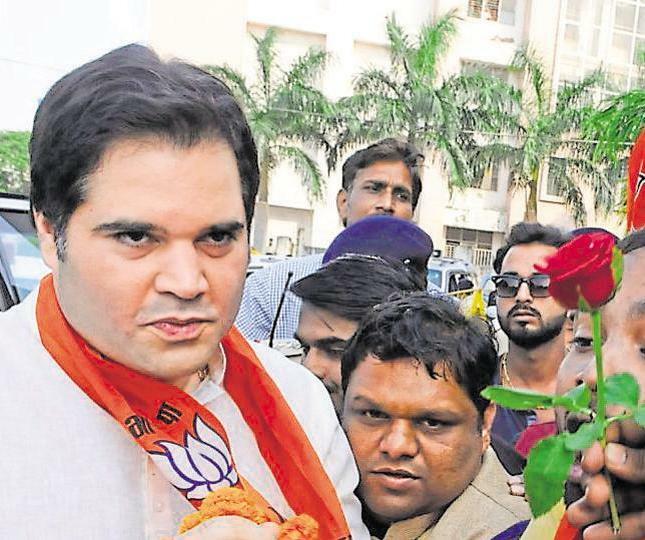 Rahul’s cousin Varun, another-great grandson of Nehru was the candidate of the opposition party in Sultanpur. Their fathers had also once stood in these parts. Hospitals and petroleum institutes had popped up bearing the names of generations of Gandhis but little else for the people who actually lived here. A little dot on the map, this region now had seven national highways thanks to its VVIP members of parliament. But it had no movie multiplex, no malls, no air-conditioned coffee shops, all part of the checklist of aspirational India. This was where that India collided with an older country where little seemed to change. Now, as it got ready for another election, the town was filled with jeeps blaring propaganda. Candidates drove down bone-shaking rutted roads, past close-cropped brown fields and sudden green thickets of banana trees, sometimes startling a herd of nilgai antelope into flight. Agitated stray dogs chased the passing cars, barking excitedly, all the way to meetings where a local minor VIP who had been waiting for hours put a fat marigold garland around the candidate’s neck. The few passable hotels in town were all full. My hotel’s entrance was jammed with cars mostly with licence plates from Delhi and Lucknow. Everyone wanted a local driver but the truly local ones were already booked. And that’s how I landed up with Salim from Lucknow. ‘What do you like to do?’ he asked me on our first day together. ‘Sometimes I like to have a beer after a day’s work,’ I replied. This was my first time covering a big Indian election. I rather fancied myself an intrepid reporter out in the field and thought my driver, a local hand, would be my Man Friday. We could bond across class divides over cold beer and warm kebabs at the end of a hard day in the heat and dust of the campaign trail. At least that’s what I thought a correspondent’s life was supposed to be like. My first bonding idea just went for a toss. I was taken aback. Salim was a clean-shaven man in jeans and a white T-shirt, his hair brushed back, his teeth stained with betel nut juice, hardly the stereotype of an observant Muslim. ‘What do you like to eat?’ he asked. ‘Anything,’ I said expansively, eager to move on from my beer faux pas. ‘I like kebabs,’ I said. ‘I hear Lucknow is famous for its tundey kebabs. What’s good in this area?’ I figured that as an observant Muslim he must know his kebabs and that might be a way to break the ice. If there was to be no beer at least let there be biryani. ‘I can’t eat anywhere that is not halal,’ he replied. Salim, it turned out, didn’t even want to touch vegetables and dal in a restaurant (though in these parts we called restaurants ‘hotels’) if the kitchen also cooked non-halal meat. He told me he had a good Hindu friend who cooked wonderful biryani. But Salim would only eat it if he himself had bought the meat. On our first day together we drove for miles along dusty highways dodging trucks and cows looking for a pure vegetarian eatery that passed muster. Starving and thirsty, I pointed at one that looked reasonably clean and served a simple menu of chicken curry and rice and dal. ‘You can eat there,’ he sniffed. ‘I’ll just wait in the car.’ We kept going. Salim also had an MBA degree, he informed me. But he liked driving because he liked to get away. He didn’t tell me at that time from what. When I told him I had lived in America for many years, he shook his head disapprovingly. ‘They don’t like Muslims in America. America is anti-Muslim,’ he said sharply. This was still Barack Obama’s America but Salim said he had read enough on the Internet. The campaign trail often throws up surprises but I had not reckoned on being saddled in a small town in the Indian heartland with a deeply conservative yet vociferously outspoken Muslim man who had an opinion about everything. But drivers were in high demand, much more than journalists were, and I had little say in the matter. Though I considered myself as having had a liberal upbringing, my friends had largely been homogeneously upper-middle-class Hindus like me. India has some 170 million Muslims, second only in numbers to Indonesia. But my exposure to Muslims had been limited to their biryanis and kebabs. In the US, I’d spent two decades in San Francisco which, for all its diversity, was its own liberal bubble as well. I’d never spent a day, let alone a week, in such close quarters with a Muslim man, especially one from such a traditional family. My Muslim friends were like me, nominally religious, many of them gay. They avoided bacon but that’s as far as their religious life went. We bonded over potluck dinners and Bollywood films, often forgetting that we came from different religions. Religion played little role in our lives. I felt singularly ill-equipped to deal with Salim. If I had been a more observant Hindu, there might have oddly been more common ground of sorts. Instead, I just felt lost, my old-school secularism amorphous and fuzzy against the hard-edged contours of his faith. The next few days with Salim were a tightrope walk. He shared fevered conspiracy theories about villainous Hindu plots and Muslim persecution in India. I nodded, occasionally demurred politely when it got too wildly fantastical but I did so nervously because he was the one at the wheel. The rallies we went to were often filled with his mirror images – Hindu patriots waving saffron flags who had come in their tractors and Bolero cars, bristling with paranoia about a ticking Muslim population bomb waiting to overwhelm India. Narendra Modi landed in a helicopter at a rally, holding up traffic for miles on the highway. A local politician who was his warm-up act read out a poem about how he would tame the Chinese dragon and teach Muslim Pakistan a lesson. A wrestler, his body painted in Modi’s party colours told me he liked Modi because he would be a strong man who would keep uppity minorities in their place. India, he said, was the Hindus’ homeland. Another man told me he liked Mr Modi because he would protect India against enemies from neighbouring countries who cut off our soldiers’ heads. Later as Rahul Gandhi’s motorcade passed through the streets of Amethi, a Muslim man watching asked me if it was true the media had all sold out and become anti-Muslim en masse. The religious politics of the Indian heartland are deeply entrenched, and Salim was a good example of that entrenchment. He would no more budge from his belief than he would have dinner at a random non-halal eatery. Every time I interviewed rally-goers and Salim ambled over to join the conversation, I could feel myself tensing. But over our week together I finally started to relax around him. I stopped riding in the back seat and started riding in front with him. I even teased him about his music choices. He loved a Bollywood hit song about a four-bottle vodka habit. This was his song to start the day. ‘You don’t drink alcohol and you like this song first thing in the morning?’ I teased him. ‘But you go places all the time, more than I do,’ I replied. He laughed. ‘It’s not the same,’ he said. He gave me career advice. He said I needed to get into television. That’s where the action was. He offered post mortems of my interviews. He argued with eatery owners when he felt they overcharged us for a plate of dal and some hot tandoori bread. He bought me a cup of tea when I was short of change. He sometimes gossiped with other drivers and told me who I needed to interview. Sometimes he even found me candidates to interview. ‘This man works for a non-governmental organisation doing voting registration,’ he told me. ‘I don’t think I need to interview him,’ I replied. One night as we were coming back from yet another rally and yet another roadside dinner of dal, vegetables and roti, he said he was feeling bad about my dietary restrictions caused by his religious beliefs. ‘Next time you come to these parts, you must come to my city, Lucknow,’ he said. ‘I’ll have a friend drive you,’ he promised. ‘He will take you to bars where you can drink to your heart’s content. And we will go have the best tundey kebabs, so soft they will just melt in your mouth.’ I assured him I was doing just fine without going to a bar. But I have to admit as our last day together dawned I was relishing the thought that I could have a guilt-free cold beer that night. Salim seemed a little pensive as he got behind the wheel. He didn’t even put on his four-bottle-vodka song. ‘I wish I could keep going with you,’ he said, as we started driving towards my next stop, the city of Varanasi, five hours away. He’d insisted he’d drop me off there though I had offered to take a bus. ‘No,’ I said shortly. He looked at me quizzically. I was too middle-aged to be single in the Indian scheme of things. Just to be polite, I asked him if he did, and the floodgates burst open. With one hand on the steering wheel he told me a star-crossed ripped-from-Bollywood love story. She was from a richer Muslim family but they had fallen in love in Koran class. They had done it all, he said much to my shock, from ‘oral’ to ‘full everything’. But when her family started looking for a husband he didn’t know what to do. Her brothers, he said matter-of-factly, had ‘done a few murders’. His own brothers weren’t too shabby either. One had taken his examinations in jail, where he was being held on a murder charge. Salim explained that he didn’t want a Montague-Capulet blood-bath. He said he’d given her a silver anklet and watched her walk out of his life. And I realised to my utter astonishment I missed him too. I looked at his number on the phone. To my embarrassment, I had saved it as ‘Driver’, my usual code for short-term drivers for hire. I changed it to his name and saved it. Then I drank my beer.